In lunar orbit, Thanos and one of his generals, Corvus Glaive, discuss the subjugation of Earth. 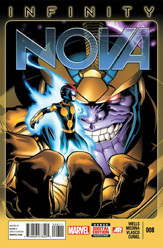 Glaive reveals that their previous belief that the Nova Corps was extinct was incorrect. 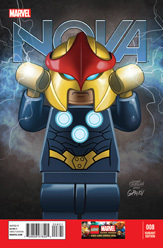 The son of a Black Nova, Sam Alexander, has been detected on Earth with a Nova Force powered helmet. Thanos is not amused and orders Glaive to send Kaldera to destroy Nova. At the same time, Thanos sends a signal to the Watcher. Back in Carefree, Arizona, the former New Warriors Justice and Speedball drive into town as Nova finishes up his repair work at the skateboard park. As Sam says goodbye to the onlookers and workers, he is approached by his friend Carrie. Sam Alexander freaks out and flies off after she whispers his real name to him! Up above the city, Nova is upset that the helmet didn't disguise his voice and takes it off in order to yell at it. He realizes that was not the wisest move as his powers disappear and he falls towards the ground! Sam is able to grab his helmet and put it back on just as he smashes into the skateboard park he just repaired! Meanwhile deep in space, Proxima Midnight goes to the slaughterdeck of a starship to find her slave Kaldera. She approaches a small alien who appears to be the caretaker of a large alien beast. When Proxima yells at the beast, a giant blade slices open the animal and a small woman walks out! This woman, not the animal, is Kaldera. The small alien attempts to explain that he tried to stop Proxima from awakening her but to no avail. Kaldera cuts off the alien's hand! Proxima Midnight shows her slave the uniform of a dead Black Nova soldier and tells her to find and kill Earth's Nova who has the same type of energy signature. Back on Earth, Sam wakes up in the back of Speedball's truck. Vance and Robbie introduce themselves to Sam and Robbie tells the young hero to hit him with a crowbar. Sam is happy to comply and discovers that the impact reveals Robbie as Speedball. They invite Sam to join their new New Warriors team because they feel it needs a Nova even if he isn't Richard Rider. Sam Alexander agrees to listen to them because they can tell him more about Rich. Across town, Kaelynn Alexander, Sam's sister, runs outside to play in the backyard while her mother fixes dinner. As she turns the corner, she finds herself face to face with Kaldera!